This body isn’t mine to have; can there be freedom from the daily grind? Mindfulness be the trend, “Buddhist-clique” the new net-sensation! Mindfulness has long been an important part of the Buddhist faith. Thanks to inexorable pressure at work and a polarized social structure, we are prone to stress and dissatisfaction. These days, even non-Buddhists may claim to be of the “Buddhist-clique”—anything is fine, I don’t care; have no worries, nature will take its course. The more serious ones are actively seeking reliefs from pent-up emotions and stress through meditation and retreats. Not yet in the job market, university students are not free from unsatisfied desires and wishes yet to be fulfilled—studies, expectations, self-positioning, relationships are all calling for attention; those seeking higher ideals and social justice can feel beaten and depressed. Mindfulness meditation helps us penetrate desires that arise and cease moment to moment, hear sounds within us and without, and let go of attachment to the self. It also helps us perceive the needs of others and ponder the intricate causes and conditions underlying phenomena, so we may make better plans for future life and action. Thich Nhat Hanh first conceived the idea of “Engaged Buddhism” during times of unrest around the Vietnam War. His mindfulness meditation finds origin in the Buddhist tradition but is adapted to suit the needs of the modern world. Throughout the year, the meditation centre he founded in France is open for joint practice with people from around the world. “UGED2297 Understanding in Practice: From Meditation to Mindfulness” is a new course of the Office of University General Education to be launched in the summer of 2019. 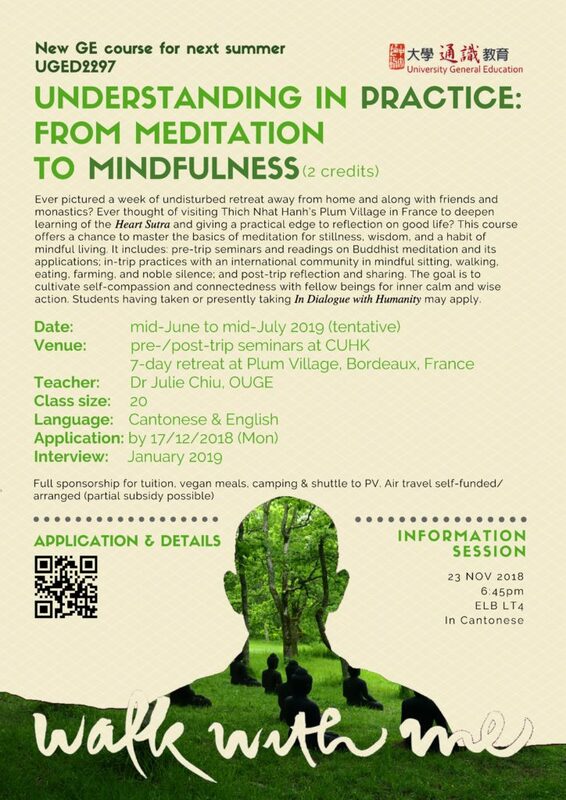 It offers a chance to extend learning of the Heart Sutra, one of the classics studied in “In Dialogue with Humanity.” Students will take part in a week’s meditation retreat at Plum Village, France, for direct experience and practice to appreciate how “emptiness of the five skandhas” and “interbeing” find resonances in real life. From sitting cross-legged counting the breaths in sitting meditation, to embracing each present moment in daily life, students will be guided to practice “right mindfulness” (samma sati). Students having taken or presently taking “In Dialogue with Humanity” may apply. Details of the course are as follows. **Full sponsorship for tuition, vegan meals, camping & shuttle to PV. Air travel self-funded and self-arranged by students. Students in need may apply for further spondsorship.